The keyring size, 3 blade folding penknife is made in Switzerland, with a 4 cm (1.6 inches), stainless main blade. 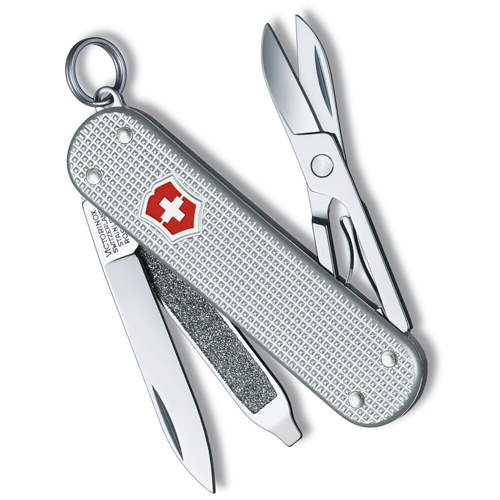 The Victorinox Knives, Classic, alox handle, 0.6221.26, pocket knife has a hard wearing, ribbed aluminium handle. Made in Switzerland, lifetime guarantee. Great little knife, hasn't failed in any job I've needed it for. Brilliant service and very fast delivery. Would happily buy again. I received the above mentioned order today for my Alox Swiss Army Knife. Just wanted to say thank you for your quick service. Ordered yesterday morning and delivered free of charge today, very impressive service and the knife is just what I was looking for. Wishing you well and continued success for your business. Just arrived, many thanks. Until now I've bought the red plastic ones which always chip and break when I drop my keys on the ground. This ones much better!